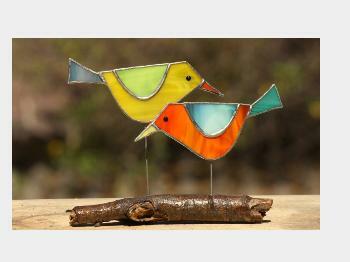 Glasshopper is a Bangalore based original stained glass studio. Although the main design profile of the studio is design and making large door and window panels and Tiffany style lampshades, it also makes smaller sun-catchers, home decor art pieces, art pieces for gardens, and jewellery on original stained glass. You are more than welcome to choose and order custom made designs and colours in stained glass. Once the amount is transferred/paid for the selected pieces, the selected art pieces will be shipped within two (2) working days (Mon -Sat) In case of an order for a custom made art piece or a piece that is out of stock and has to be re-created, the time taken will be 3-5 working days for shipping. The amount paid shall be refunded or the art piece will be replaced by the seller in case of breakage during the speed post on arrival to the buyer. Shipping charges will be taken care by the seller once the broken piece is shipped back by the buyer to the seller.